Two Tadcaster Grammar students last week told a meeting at the House of Lords of their efforts to champion sport for all. Siblings Jemima and Will Browning told those gathered at the event staged by Play Unified, a global movement aimed at ending intolerance towards you people with learning disabilities through sport, spoke about their work at their school. 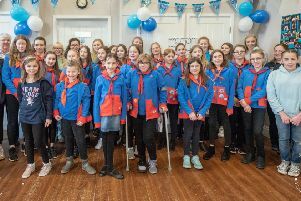 Jemima, who has started writing a column in the Wetherby News, said: “I feel that everyone should have the same opportunities to take part and succeed. “From personal experience I have seen how people sometimes struggle to see past a person’s disability, as is the case with my brother. Jemima set up an inclusive committee at her school where students decide what they can do to change attitudes towards people with intellectual disabilities and organise sporting activities that appeal to everyone. Play Unified is led by Special Olympics Great Britain and delivered in partnership with the Youth Sport Trust – jointly funded and administered by DCMS and Sport England. It aims to change attitudes towards and perceptions of young people with intellectual disabilities through sport, working on the principle that playing and training together will create friendships and understanding between them. The ultimate goal is to create a ‘unified generation’. Play Unified held a series of youth summits across the UK throughout 2016, where Young Ambassadors were inspired to drive the campaign – using sport and leadership skills to break down barriers. More than 500 young people have joined the campaign as Play Unified Young Leaders, exceeding Play Unified’s two-year target by 20 per cent in just 12 months – an even split of young people with and without intellectual disabilities.